We’re often asked for examples that show and tell how our membership management software can make a difference to small associations, clubs and non-profits. Last week we showed how one organization used our standard templates to create a fantastic website. In this guest post, Lamees Abourahma offers an example of how another organization streamlined membership records and increased event registrations, after transitioning to Wild Apricot with the help of one of our service partners, Webbright Services. When Talya Huskey joined the Virginia Veterinary Medical Association (VVMA) as the organization’s Membership and Conference Coordinator a year ago, she and Executive Director, Robin Schmitz, knew the current records system needed an upgrade. As a small-staffed association that serves over 1,300 veterinarian and veterinary student members, VVMA needed a smooth, integrated system that allowed for quick and accurate updates to the organization’s membership and events databases. What they had was an outdated, time-consuming, three-step process that took too much of the staff’s limited time and allowed too much room for error. VVMA represents and promotes the interests of the diverse veterinary community and serves as a resource on matters of animal health, animal welfare, and the human-animal bond. The association works on a number of legislative issues, presents two continuing education conferences each year, and provides valuable business partnerships to its members. In other words, VVMA is a dynamic association, and its staff must wear a lot of hats to get everything done. Prior to moving to the membership management software, VVMA was strapped with a system consisting of the platform’s backend, an Excel spreadsheet, and a cumbersome ring binder packed with hard copies of the records. In addition, the organization had to use a completely separate system to keep up with event management since the other software wasn’t equipped to handle it. Fast-forward to today, and VVMA – and their members – are happily using Wild Apricot, powered by Webbright, and what a difference the transition has made. Now, the staff saves time by updating membership records in just one place, instead of three. Their new platform allows everything to be done on the backend and enables easy Excel exportation, eliminating the need for hard copies and extra steps. Adopting this new software has replaced the tedious three-step process with a smooth, integrated one that is more accurate and efficient. In fact, Talya says the time to process a membership renewal or new member has been cut by one-third. And, since Wild Apricot can accommodate both membership and event records management, the VVMA team can keep everything in one place to save even more time. According to Talya, records management isn’t the only area that has improved dramatically since adopting the membership management software. VVMA’s previous website made it difficult to add new content and limited the staff to just basic editing capabilities. So, they were stuck with waiting for slow developer turnaround times every time they needed a website update. The association now has complete control over their content, thanks to Wild Apricot's user-friendly features. Now Talya and the rest of the staff also have control over the message VVMA is presenting to the world because the website is always up-to-date. But the best testimonial might be what the association hasn’t heard. Since Webbright got their new website up and running earlier than projected (in just six weeks instead of eight), VVMA has been able to use it for their upcoming conference in November, and have had no complaints about complicated registration or payments not going through – that they used to hear! Talya believes the new system is also responsible for an increase in registration for the association’s upcoming picnic. VVMA has seen more of their veterinary student members register for the event than ever before, and believes this is due to the new and simple online registration process. In addition, for organizations looking for a custom design that exceeds Wild Apricot’s templates, as VVMA did, Talya suggests having professional web designers who know platform inside and out (like Webbright a Wild Apricot partner), and can leverage it for your organization and make a website upgrade the seamless next step for your association. Lamees Abourahma is president of Webbright Services LLC. Thank you for sharing this post Lori. 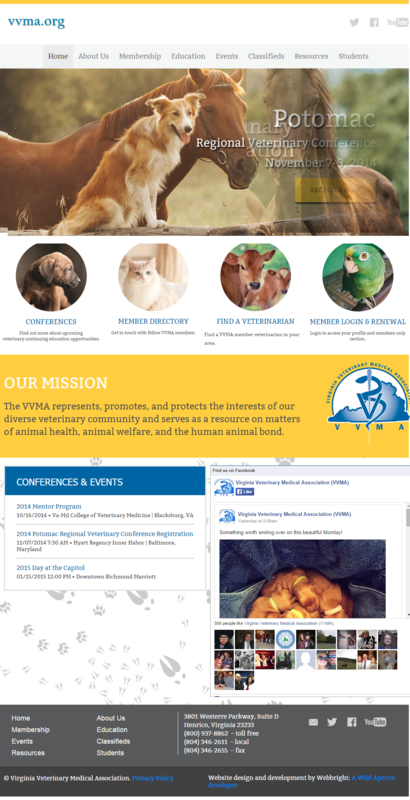 It's always a pleasure to make an impact on clients, like the Virginia Veterinary Medical Association, and show them all the amazing things they can do with Wild Apricot. I met with Talya recently and was delighted to hear how much they like their new website and how they continue to use it for all their membership activities. Lamees - thanks for the great insight in this guest post! Can you print address labels from the software? Could you print a member directory from it? My association has been a WA client for about 3 years now and it's been great. We went from an Access database for membership to this and it's much easier. We're looking into bundles as well and hope it will work for us. If it does, we'll implement it in December 2014. Gretchen, I've never looked into printing labels. But, you can select membership data to export into Excel and it's easy to print labels from there. Same thing with the member directory - you can export the information to Excel and do what you want with it from there. You can also create an online member directory and limit access (or not). First - thanks Stephanie for recommending Wild Apricot and responding to Gretchen's questions! So great that we have so many Wild Apricot enthusiasts! I'll just add that you can print pages from your site (e.g. Member Lists or Directories) in both public and admin views - you'll find the details on printing here: https://help.wildapricot.com/display/DOC/Printing+in+Wild+Apricot. Byron: Thanks for your note and welcome to Wild Apricot! Also - feel free to reach out to our support team via email at: support@wildapricot.com for help with your specific set-up needs.